Following the departure of the defeated Guardian and his followers, a new threat to the Mall Rats emerges. The Techno invasion has begun – they are clearly technologically advanced but who are they and where have they come from? Rumours abound the city that they could be adults returning to take control. Amber is in labour and the pain is getting steadily worse. Bray is nowhere to be seen and his disappearance is causing concern. Will Amber survive the traumatic birth and what will become of her baby? 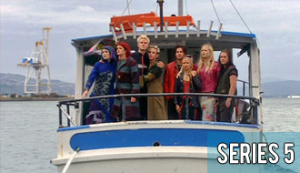 The fourth series of The Tribe throws up new challenges and difficulties for the warring factions – will the dream stay alive?